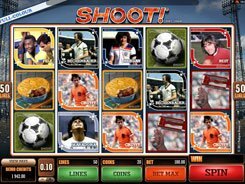 The slot was released by Microgaming to celebrate the 2015 Rugby World Cup held in Britain. 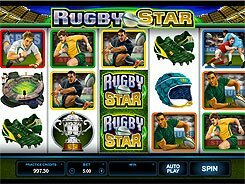 Rugby Star is played over 5 reels and has 243 ways to win. This means that winning combinations are created by matching symbols landed on adjoining reels starting from reel 1. 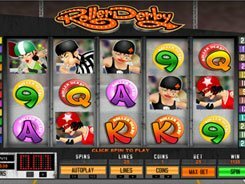 A total bet can be set up from $0.5 to $250 per spin that will suit both high rollers and economic players. The reels are populated by top-league rugby players from Australia, Argentine, England and other countries. 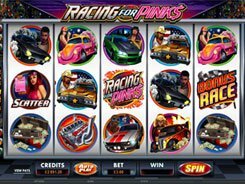 The slot is packed with special features like rolling reels, scatters, free spins, stacked wilds and a unique Wild Pass bonus that turns one or two reels into wilds. The top jackpot prize you can win in the slot is 250 times your total bet or $62,500 if playing at the maximum bet. 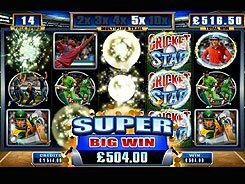 Hitting at least three scatters awards up to 25 free spins with an alluring Rolling Reels feature that provides a cumulative multiplier that gets bigger with each consecutive win up to a maximum of x10. 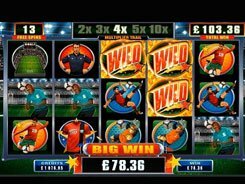 In all gaming modes, a wild symbol comes stacked on the last three reels to help you earn more combinations.